The first stop is Pontemaceira, famous having a medieval bridge from the 14th centuty. Millions of pilgrims cross over this bridge every year. We will quickly stop at the top of Paxareiras, a fantastic viewpoint that allows us to contemplate the Galician coast. The next stop Muros, a coastal city that has been declared a Historic-Artistic Monumental Site in 1970. Its original architecture Muros is notable for the sea arcades of the houses, under which the fishing tackles were fixed and the fish was salted. It has a beautifully restored old town that keeps its original image. The next stop is the 40m-tall waterfall of Ezaro, the only one in Europe that empties directly into the ocean. Until 2010, this waterfall was not allowed to flow unless there was an excess of waterflow on the Rio Xallas. This was due to a hydroelectric plant that was built in the middle of the 20th century that pretty much cut off the flow of the falls. 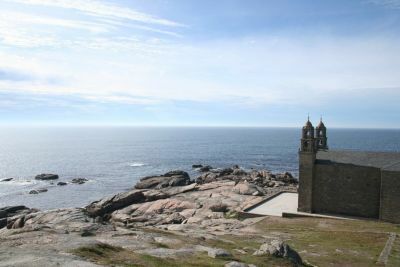 The next stop on the road comes at Finisterre, also known as “the end of the world”, where we will explain some legends and tragedies that happened in this area. The Costa Da Morte was given this name because of the large number of shipwrecks along its rocky and dangerous shore. After lunch, we will visit our last stop: Muxia. This village was ground zero of the Prestige disaster (a oil-transporting vehicle accident that spilled 70,000 gallons of oil into the Atlantic Ocean in 2002). A monument called " A ferida" (The wound) was build in order to remember all those volunteers from all over the world that came help cleaning the Galician coasts. Muxia’s main church is the Santuario da Virxe da Barca which stands on a rocky ridge right next to the sea. Also, we will be visiting Muxia`s rocking stone, the Pedra de Abalar, a large stone that are balanced on a point, so that it can be moved back and forth easily, and it is meant to be able to heal most diseases, induce fertility, or determine guilt vs. innocence. There are also other famous rocks such as Pedra dos Cadris or kidney stone. It is said that if you pass underneath this rock nine times, your kidney and/or back and head pains will go away. After that we will take a short trip by road to Fisterra and Cape Fisterra where you will have free time to lunch. Then we will reach our last stop, Muxia, where will visit the Santuario da Virxe da Barca which stands on a rocky ridge above the surf. Return to Santiago de Compostela by road.